Vale de Covo Offering access to an outdoor swimming pool, the Vale do Covo apartment is a 2-bedroom unit located 7 minutes’ walking from Centianes Beach. 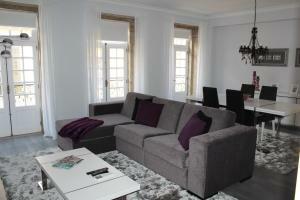 The living room has a dining area, sofas and a flat-screen cable TV. The kitchen is fully equipped, and allows guests to prepare their meals..
Vila Nova Offering an outdoor swimming pool, Vila Nova is located in Lagoa. The unit’s full kitchen has a microwave and a refrigerator. Guests are welcome to try cooking their own tasty meals in the kitchen. Algar Seco Parque Situated at the top of the hills overlooking the sea, Algar Seco Parque offers comfortable air-conditioned apartments with access to outdoor pools just a 10-minute walk from the centre of Carvoeiro, Algarve and its idyllic beach. Featuring 1 or 2 bedrooms, each apartment comes with private bathrooms and fully furnished to the highest standards. Vale D'oliveiras Quinta Resort And Spa price per day from € 128 Peacefully located in Carvoeiro’s countryside and surrounded by lush gardens, this resort features an outdoor pool surrounded by palm trees and a fully equipped spa and gym. The bright and airy rooms and suites at the 5-star Vale D'oliveiras Quinta Resort And Spa feature a balcony or terrace overlooking the resort's grounds. Hotel Mirachoro Praia Situated near Carvoeiro Beach, a 5-minute walk away, Hotel Mirachoro Praia offers outdoor and indoor pools and a sun terrace with loungers and palm trees. For those who wish to explore the area, staff at the 24-hour reception desk can organise hiking trips and Hotel Mirachoro Praia also offers car and bicycle rental services. Regional and international specialities are served at the contemporary, brightly decorated restaurant..
Agua Hotels Villas price per day from € 139 Located in Carvoeiro, Agua Hotels Villas offers luxurious and modern villas. The elegant accommodations feature an ample living and dining area, with sofas, a flat-screen satellite TV and a DVD player. 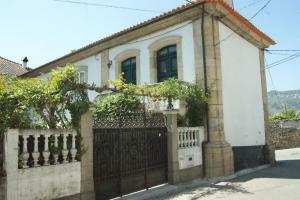 Quinta dos Oliveiras price per day from € 45 Located just north of Carvoeiro, Quinta dos Oliveiras offers air-conditioned rooms with a balcony or patio overlooking the pool, garden and lake. The individually decorated rooms are equipped with free Wi-Fi, a satellite TV and fridge. There is a microwave and cutlery in the communal kitchen, and local bars, cafés and restaurants are within a 10-minute drive..
Terracos De Benagil price per day from € 86 Terraços De Benagil is just 3 minutes' walk from Carvalho Beach. 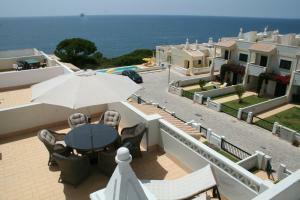 Terraços De Benagil villas have air conditioning, and include a living area with flat-screen TVs. The Terraços also features a landscaped garden and barbecue facilities..
Tivoli Carvoeiro price per day from € 31 Perched on top of a cliff above Praia Vale Covo, Tivoli Carvoeiro offers an outdoor pool and a terrace bar with Atlantic Ocean views. Páteo Restaurant offers an American-style buffet breakfast, and there is also a pool-side coffee shop. Hotel Carvoeiro Sol Situated in the heart of the typical village of Carvoeiro, the Hotel Carvoeiro Sol finds itself within 25 metres of the beach. Carvoeiro’s restaurant Jardim do Sol serves a rich buffet-style breakfast in the morning with a variety of hot and cold dishes. 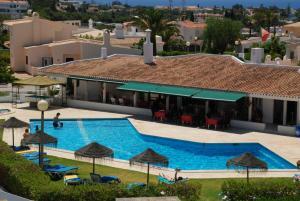 Golf club Vale da Pinta, 3.5 km from the centre of town of Carvoeiro. 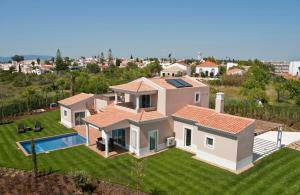 Golf club Penina (Championship), 11.8 km from the centre of town of Carvoeiro. Golf club Morgado, 12.4 km from the centre of town of Carvoeiro. Golf club Palmares (Praia & Lagos), 15.7 km from the centre of town of Carvoeiro. 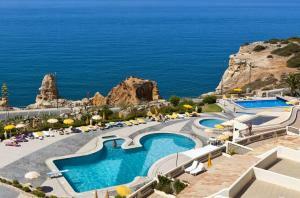 Golf club Oceanico (Victoria), 28.9 km from the centre of town of Carvoeiro. Golf club Oceanico (Millennium), 29.5 km from the centre of town of Carvoeiro. Golf club Oceanico (Laguna), 29.7 km from the centre of town of Carvoeiro.